Audi is one of the world's most prominent luxury automakers. The A4 allroad wagon showcases Audi's famous high-quality design and engineering. The sleek exterior isn't just stylish, it's also aerodynamic. It helps the A4 get an estimated 30 mpg on the highway. The A4 allroad isn't great just on the highway. It's equipped with quattro all-wheel drive. This means that torque is applied as-needed, so you can take this car down any road in comfort. The 2.0 L engine delivers up to 248 hp and an amazing 273 lb-ft of torque. There are also nine standard colors to choose from, which makes it easy to make this wagon your own. In addition to power and aesthetics, the A4 allroad is practical. It seats five adults. It has 24.2 cu ft of cargo storage, or 58.5 cu ft when rear seats are folded forward. 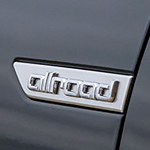 To test-drive the A4 allroad, contact us at Audi Allentown today.